In 1945, a young playwright named Tennessee Williams popped into a New York glass shop, located where Lincoln Center now stands, and inquired about buying animal figurines from a glassblower named John Cudequest . At first, the glassmaker objected to selling his fragile artwork as props that would be broken during performances of a play. But when Williams told him the play would be a success and require hundreds of glass unicorns, Cudequest's business sense prevailed. The play was "The Glass Menagerie," and it made Williams famous. For each of the 561 New York performances, Cudequest created - and personally delivered to the theater - a small glass unicorn. And each time, in a scene of memorable symbolism, the unicorn's horn was broken. 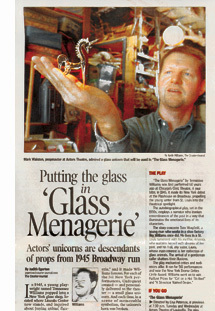 Now Kathy Warner, the daughter of the man who made those glass animals for the New York debut of Williams' classic play, has created the unicorns for the Louisville production of "The Glass Menagerie," which opens this week at Actors Theatre. Finding Warner, who learned glassmaking as an apprentice to her father, was a karmic kind of coincidence, according to Mark Walston, propmaster at Actors for the past decade. "It really touched me. Tennessee Williams is my very favorite playwright. And it's the most exciting coincidence in my career - one that makes me realize how much I love my job." A co-worker at Actors had visited a glass-making shop at Holiday World in Indiana and brought back one of the spun-glass unicorns and a business card to Walston. He tried calling the shop several times and was about to give up when he reached Warner. "I was looking at other options. It's so easy to find things online now. But I am so glad that I went ahead and found her," he said. It turned out that Warner, 60, knew exactly what kind of unicorns to make - figurines 3 inches high in a design popular in the 1940s and '50s. She told Walston about how her father and Williams became acquainted (both men are now deceased) and readily agreed to make unicorns like the ones her father had made for Williams. "They are relatively simple to make and are a staple of our animal collection line - unicorns have been in the family shop for 60 years," Warner said in a recent interview. It takes about 20 minutes to create a unicorn from a rod of red-hot glass. In all, Warner spent about two days making more than 40 of them for Actors Theatre. They cost about $6.50 apiece. "I've been a glassmaker for 42 years," she said. "I was an apprentice to my dad, and my sons were apprentices to me. The type of work we do originated in Germany 300 years ago. It's called flame-working. We work with cold glass rods. We use no patterns or molds and a very hot fire. We create the piece one at a time from start to finish. It's all done freehand." Besides the Holiday World shop, Warner and her husband, John, who also is a glassblower, own a glass-making business in Lake Placid, N.Y., and divide their time between the two. Their two adult sons are glassblowers with businesses in Georgia. The Warners have created glass art ranging from tiny fairies and medieval dragons to an elaborate and delicate stagecoach drawn by six horses and carrying women who hold miniature purses. And over the years, Kathy Warner has continued her father's artistic contribution to a play by one of America's greatest playwrights. She has made unicorns and other glass animals for "The Glass Menagerie" produced by theater companies in Vermont, Florida and Indiana. Her father, John Cudequest, eventually left New York. In the 1960s, he owned a glass shop at Santa Claus Land in Indiana. Later he lived in West Palm Beach, Fla., where he operated a popular glass-making business. He was a frequent guest on the "Captain Kangaroo" show and was renowned among glass artists and collectors for his swans and carousels. Like Williams' play, which is a remembrance of family, requests for the glass unicorns bring her father fully into Warner's mind and heart. "I picture my father as a young man and an artist who says, 'Absolutely not - you can't break my beautiful art pieces.'" She recalls her father telling the story of his first meeting with Williams, whom he described as 'a heckuva nice guy.' When Williams suggested that his play might run a long time and need 1,000 or so unicorns, her father became a businessman at that point, Warner said. And Warner's sons have the knowledge and skill to continue the family tradition of making unicorns for Williams' play. Meanwhile, Walston, who rarely saves props as mementos, is making an exception. He'll keep one of Kathy Warner's handmade, spun-glass unicorns as a tangible connection to his favorite playwright. "The Glass Menagerie" by Tennessee Williams was first performed 60 years ago at Chicago's Civic Theatre. A year later, in 1945, it made its New York debut at the Playhouse on Broadway, propelling the young writer from St. Louis into the theatrical spotlight. The autobiographical play, set in the 1930s, employs a narrator who invokes remembrances of the past in a way that illuminates the emotional lives of its characters. The story concerns Tom Wingfield, a young man who works in a shoe factory like Williams once did. He lives in a St. Louis tenement with his mother, Amanda, who sustains herself with dreams of her past, and his frail, shy sister, Laura, whose main interest is her collection of glass animals. The arrival of a gentleman caller shatters their illusions. The play enchanted critics and audiences alike. It ran for 561 performances and won the New York Drama Critics Circle Award. Williams went on to win Pulitzer Prizes for "Cat on a Hot Tin Roof" and "A Streetcar Named Desire."